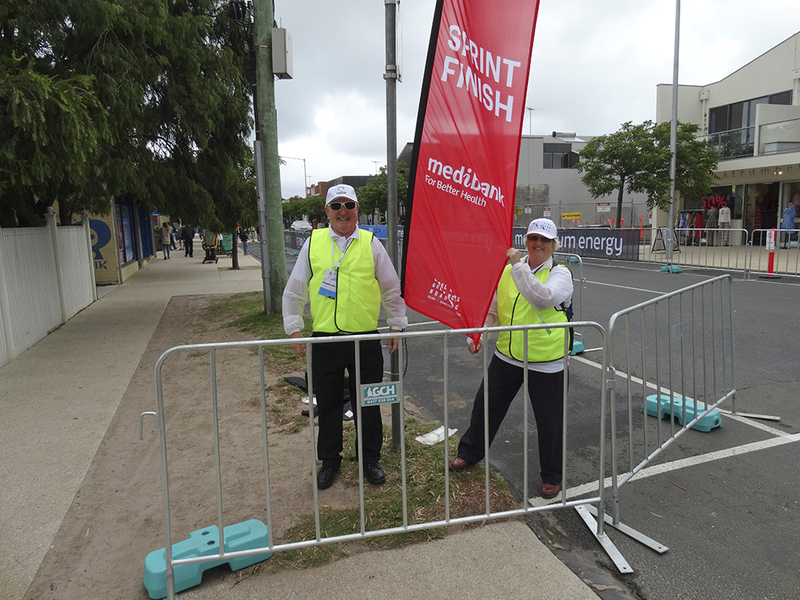 Stephanie & I were very grateful to be asked by Cycling Australia to work the Sprint Finish Line, Hitchcock Ave ( the main street ) in Barwon Heads yesterday. We arrived early at The Workforce Tent is drizzling rain & mist, there were very few people around, it looked such a grey & miserable “Send Off ” for such a wonderfully dedicated, disciplined & modest World Class Cyclist. He NEVER deserved to be sent off in miserable conditions !! By 11am there was only a small number of dedicated, enthusiastic followers who had taken up their favourite position on the portable wire barricades lining either side of the main street. The southerly wind was strong & cold & the drizzle continued to the extent that it looked as if the weather was going to totally RUIN Cadel’s last UCI Ride ! Twenty minutes later the crowds appeared from nowhere with lots of young children on their bikes, dogs on leashes, ( Stephanie & I can’t work out why people bring their dogs to the bike races !!! ) avid cyclists arrived in bunches on carbon fibre bikes in lycra, lots of shopping & mountain bikes & I spoke to a lot of spectators who came from Melbourne & locals who wanted to know what time the cyclists were expected. 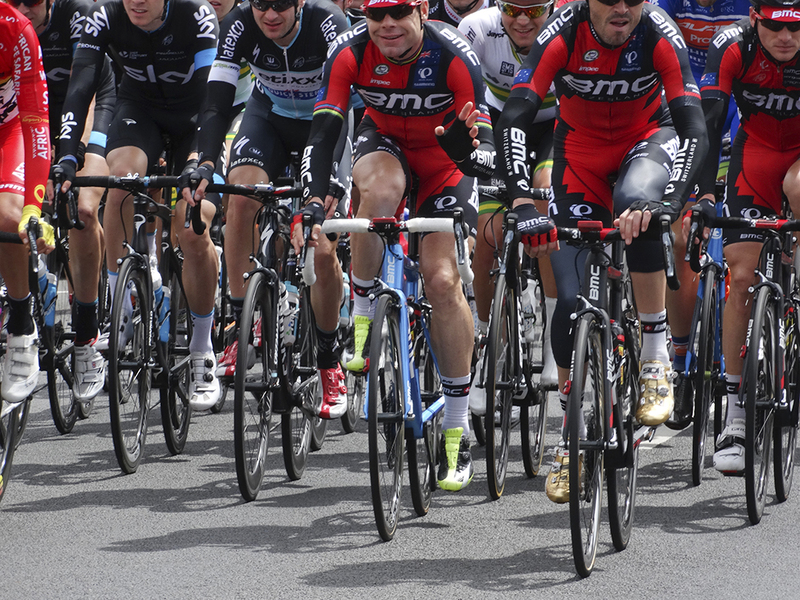 We were only too happy to ask the kids to ring their bells for Cadel & most adults got a laugh when I asked them to yell “Farewell to Cadel ” The atmosphere was electric, & full of excitement as the sun came out, which was wonderful & very appropriate. At 11.30 am Hitchcock Ave was packed from top to the bottom corner with spectators 3-5 people deep along the whole street ! A few minutes to 12 MD the Peloton turned right into Hitchcock Ave & there on the front row was his entire BMC team & with Cadel riding in the middle taking in the enthusiastic atmosphere with all the applause & appreciating how many people came out to show their loyal support for him. As he passed over the Sprint Finish Line he shook his head gently from side to side in amazement of the huge crowd who yelled out “Go Cadel ” “Go Cadel”. I am sure it was a very exciting yet- sad moment for him. Watching this put a lump in my throat & I for one shed a small tear as many other spectators did.. ! What a momentous occasion for Geelong. 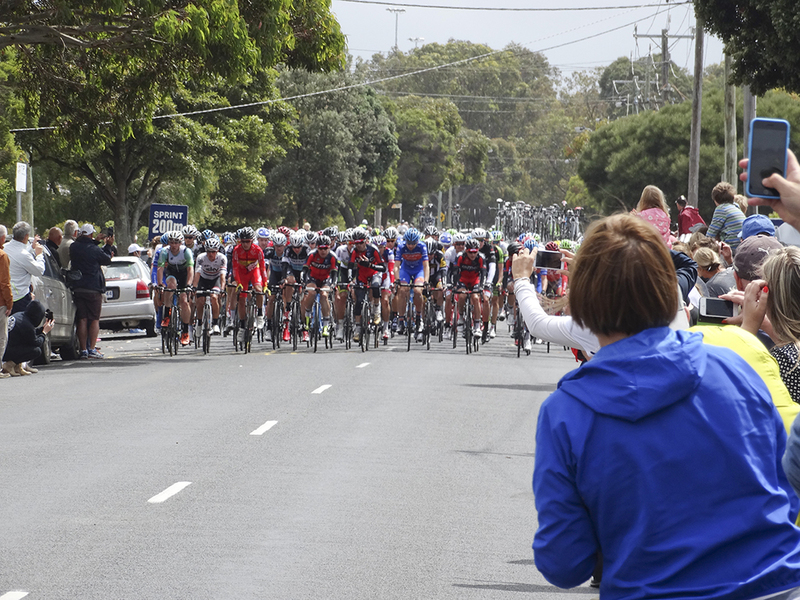 This entry was posted in Cycling events, Events and tagged Barwon Heads, Cadel Evans, Cadel Evans Great Ocean Road Road Race by hlyth2013. Bookmark the permalink.